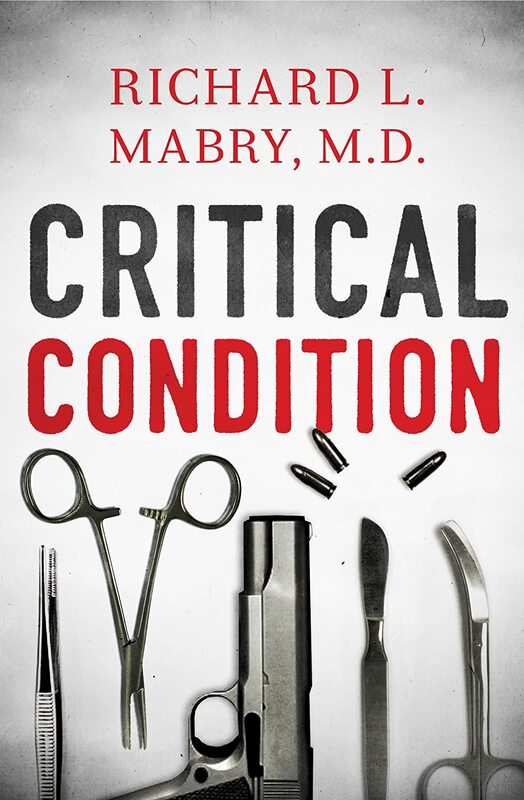 If you are a fan of Richard Mabry's other books, you'll enjoy this one too. 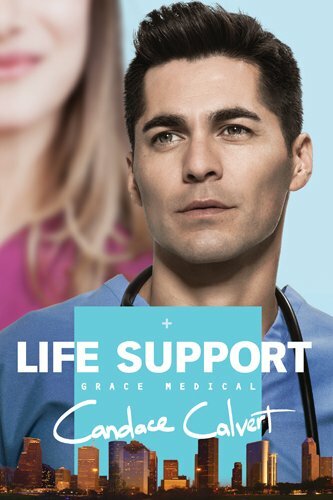 Like the others, it is a fast-paced romantic Christian suspense featuring medical and legal scenes. Like the others, it takes quite a few liberties with the legal aspects. Like the others it is somewhat unrealistic and like the others, it has a happy ending. The Christian aspects of the book are interwoven throughout the story. The characters pray before meals--or the fact that they don't is mentioned. Shannon's dad is a pastor and go to church with Shannon a couple of times. We learn that one thing keeping Shannon from committing to Mark is the strength of his faith versus the weakness of hers. Nevertheless, this isn't a conversion story and no angel comes to the rescue. Question of the Week: Who is your favorite Catholic author? (from Faith). Honestly, for all the books I read, I have few favorite authors and really wouldn't want to name one. Hope everyone had a good week. My daughter and I went to horse camp with her Girl Scout troop, which she really enjoyed. I liked the fact that they got a taste of the whole horse experience, from putting food in one end to taking care of what came out the other. She learned enough about horses to give a speech about them at school on Monday. Unfortunately, the rest of the week didn't go so well. My Dad is in the hospital again and when he comes home it will be with hospice care. We've known for a long time that this was coming but it doesn't make it any easier. 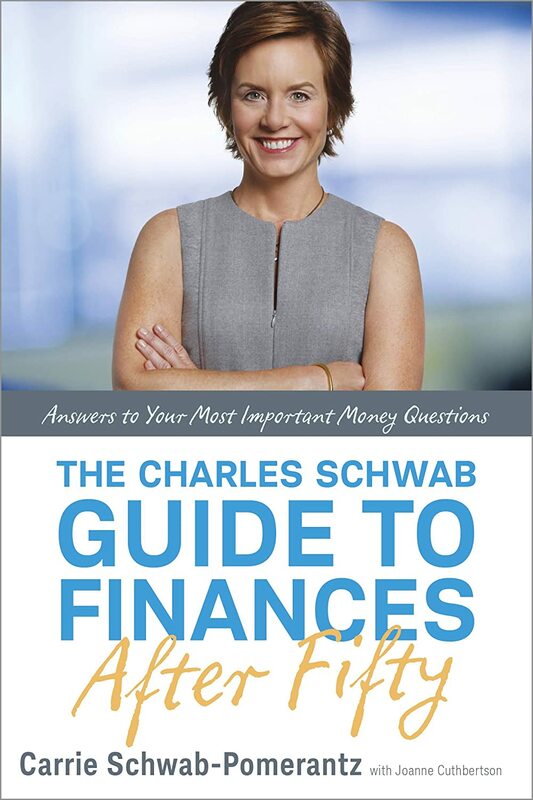 My only post this week is a review of The Charles Schwab Guide to Finances after Fifty, which I highly recommend. Yes, I'm over fifty. I've worked more years than I expect to continue working. I'm seeing people who were middle-aged when I started with my current firm retire,and people a few years older than me move into management. My children are almost grown, my house is paid for, my Mom has passed on and my Dad's days are numbered. My 401K balance is substantial, at least compared to what it was for many years, and the contributions are bigger than they ever have been. My husband and I both consider our jobs to be pretty stable, but neither one of us expects to make substantially more money than we are making now. In short, we aren't young adults anymore; we have reached middle-aged success and we are making plans for the next phase of our lives. Planning for that stage is what is addressed in this book. Question of the Week: How often do you go to confession? Do you have a regular confessor or do you go to different priests? Not often enough. I had a regular confessor for a while and it was a good thing. He moved and I haven't found another and I have all the usual (bad) excuses for not going. 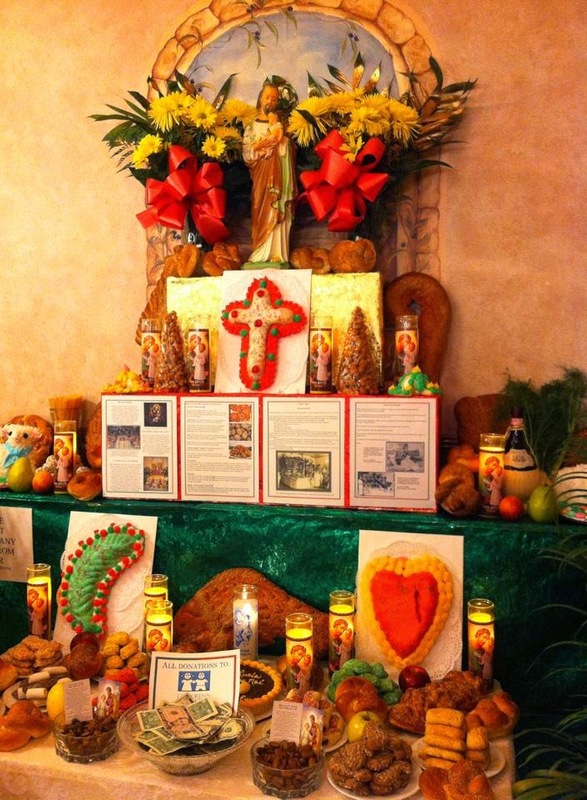 This week I wrote about St. Joseph's Day. 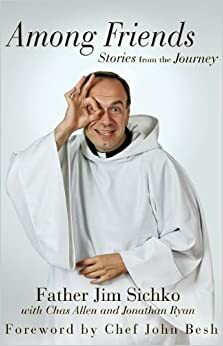 I reviewed an inspirational book by a priest. I reviewed a romance novel. You'll have to play without me this weekend as I am headed to horse camp with my daughter's Girl Scout troop. Wish me luck, I'm still in a boot for my sprained foot. 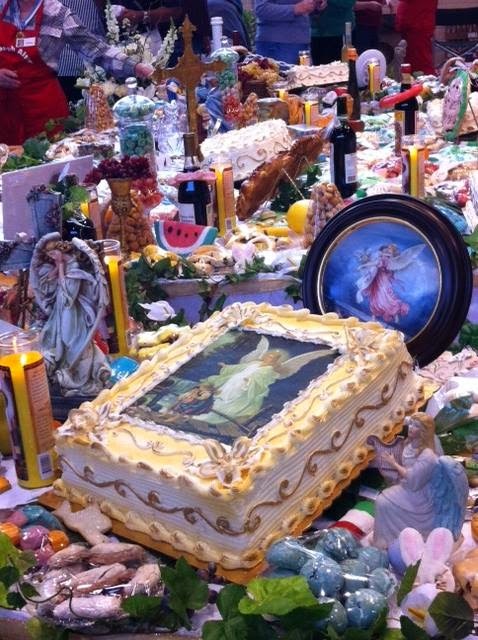 Wednesday was St. Joseph's Day, and here in New Orleans, particularly for those of Sicilian descent, that is an important day. It is celebrated with parades and balls and altars. 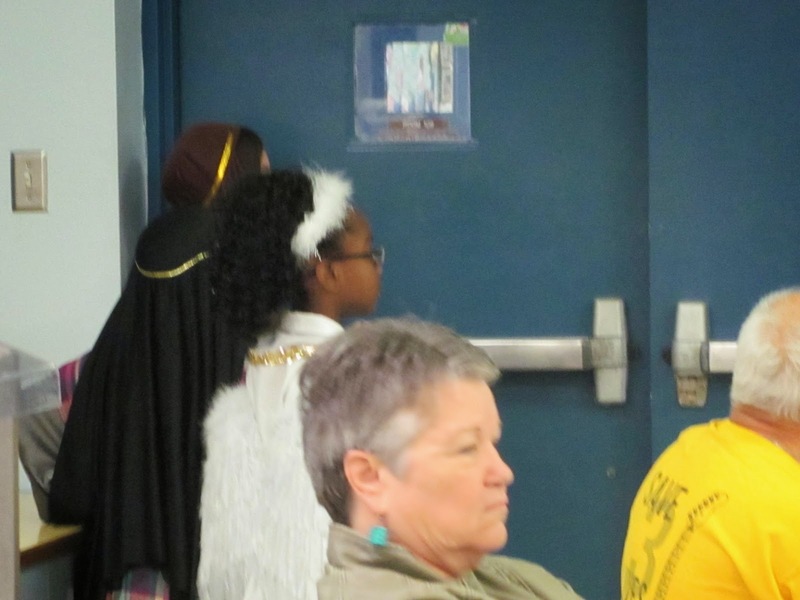 This year my daughter's class sponsored the altar at school and she was chosen to play Mary. 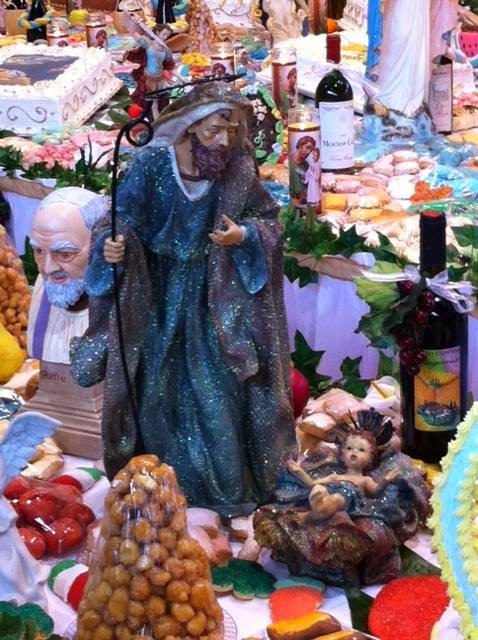 The custom of the St. Joseph Altar started in Sicily in a time of famine. The people prayed to St. Joseph for help and rain came. 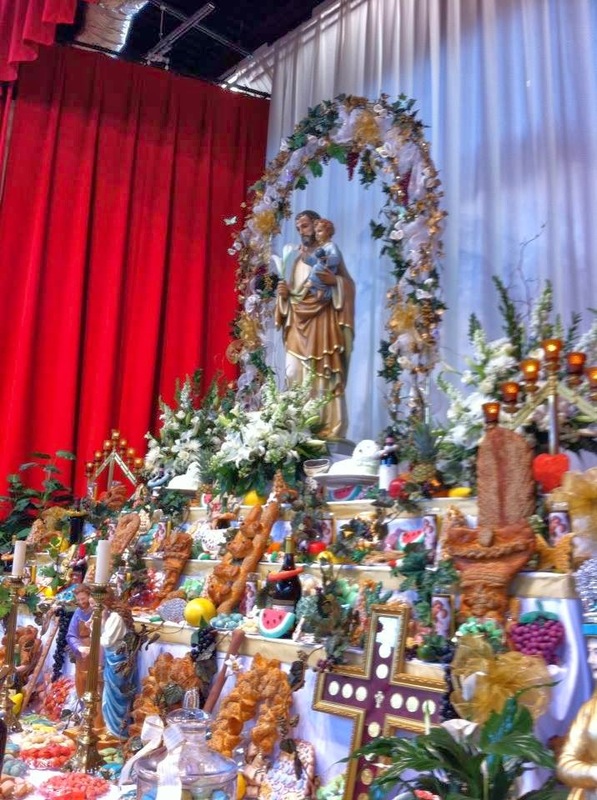 The grateful people took some of the fruits of the earth and arranged them on an altar to honor St. Joseph, and then donated them to the poor. Today in New Orleans the newspapers publish lists of altars and some people go from one to another. Often food is offered to all who visit during certain times. 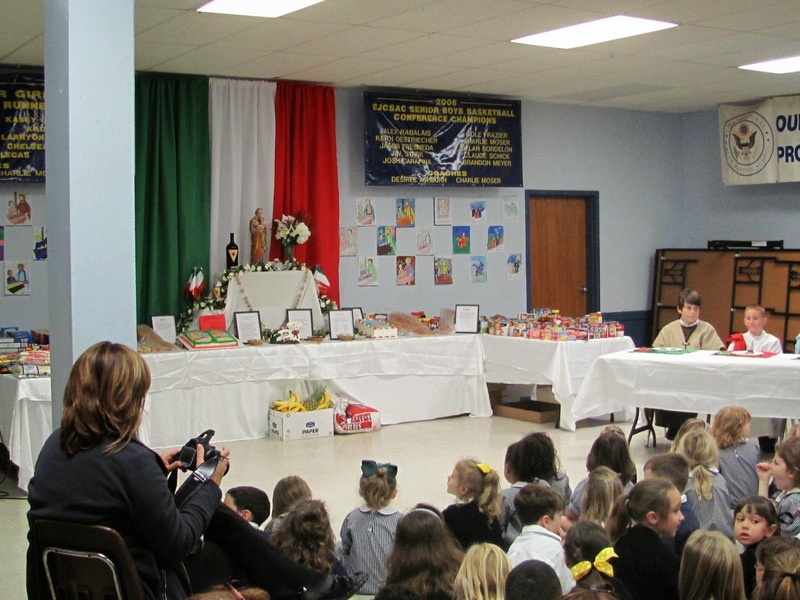 The non-perishable food from the school's altar went to the parish food bank; the perishable food (pretty much just the cakes) went to a nearby old folks home. What does that have to do with my daughter being Mary? 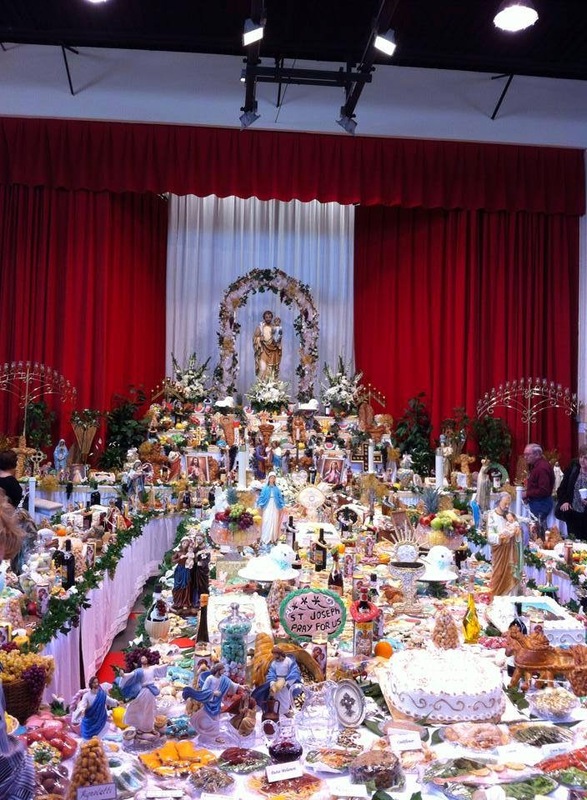 Part of the St. Joseph's Altar tradition is the "Tupa Tupa", a term I'd heard before but had no clue what it meant. Lucky for me, the newspaper had a picture of another school, with a short write up about the Tupa Tupa, so I knew the skit wasn't something invented by our school. 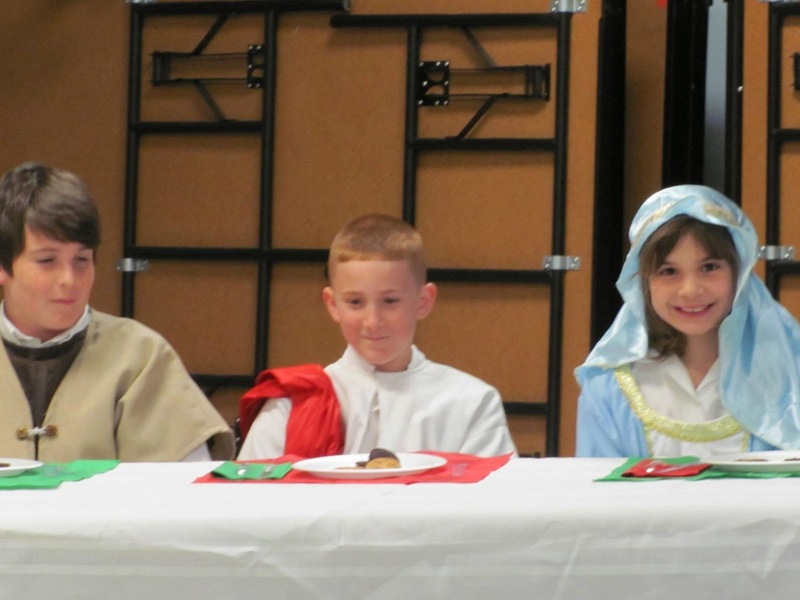 People are selected to represent Jesus, Mary, Joseph and the angels (we had shepherds too). St. Joseph knocks on three doors, looking for food and shelter for his family. (luckily the school cafeteria has three doors). After going inside, the Saints are treated to a meal that traditionally includes a taste of each item on the Altar. 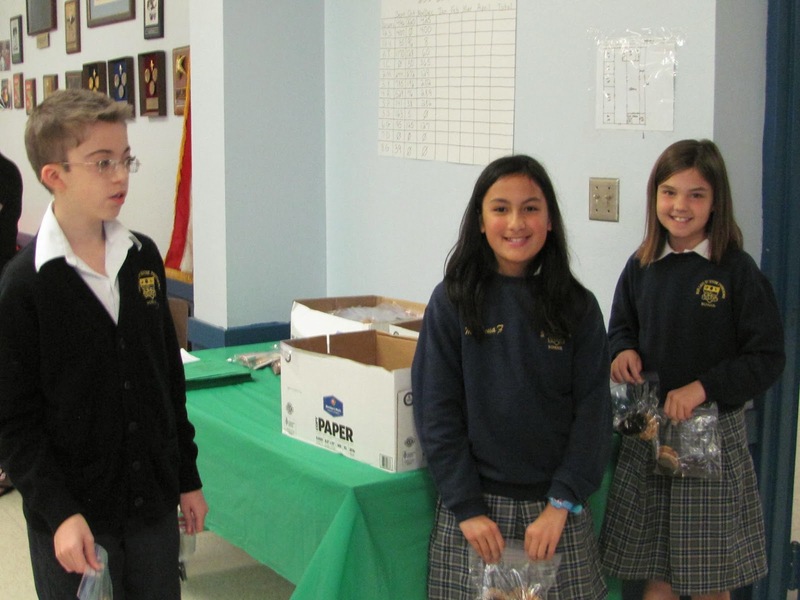 That meant my daughter got two chocolate chip cookies before her classmates got theirs. 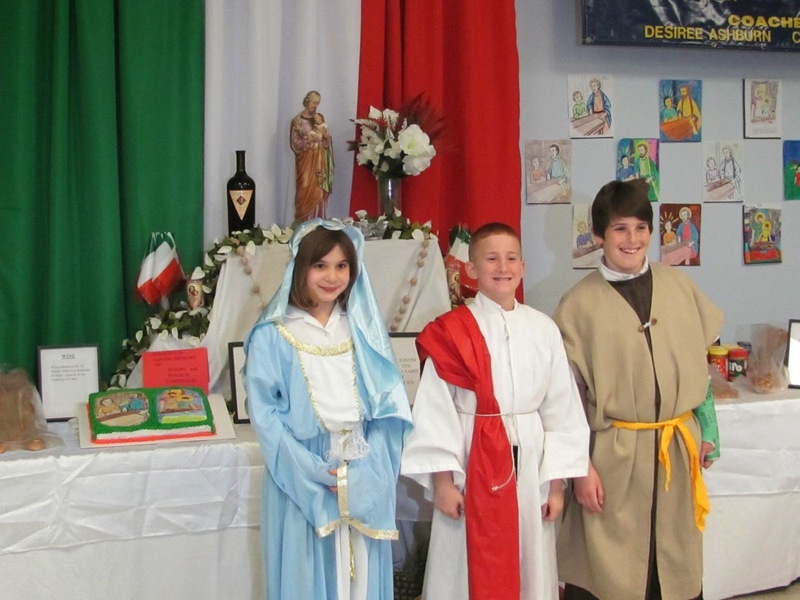 Compared with some, their altar was small, but I love the way the school is passing this tradition down to our kids. 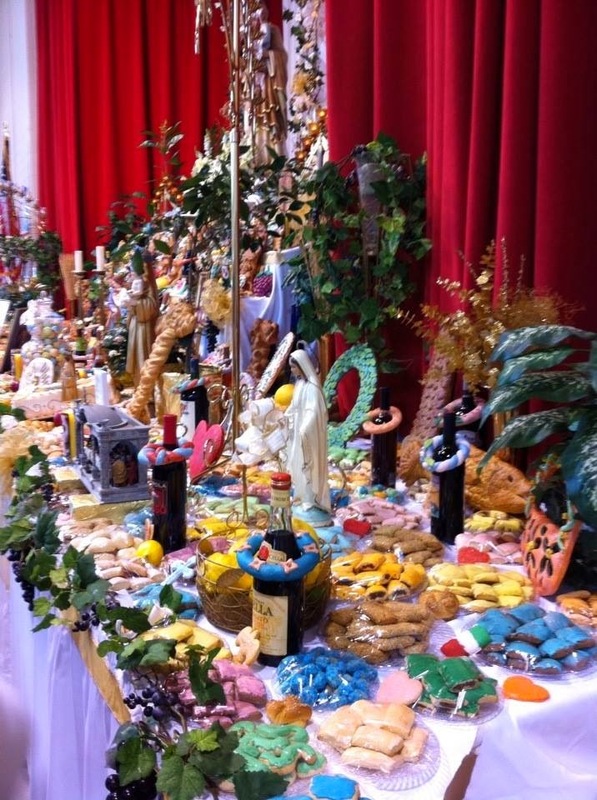 Even altars that don't offer a full meal (or those you don't get to when the meal is being served) usually offer you Italian cookies and a fava bean to take with you. I'm guessing they figured the kids would prefer chocolate chip because that's what they gave away. Some of the altars are really big and elaborate. Here are some photos a friend took. The first five are from one of the biggest altars in the area. The last one is from an Italian ice cream parlor. Fr. Jim suggested reading this book a little at a time and reflecting on each story. I didn't do that, I read it straight through in a couple of nights on the treadmill. The blurb above mentions that Fr. Jim is a motivational speaker, and that's how this book read. He was engaging, uplifting, motivating, and put enough of himself in the picture so you felt connected, yet I always had the feeling he was giving us a stage persona (not to say that's a bad thing, just that it is an incomplete picture of a person, but then there is no way I'd give a room full of strangers a complete look at me either). Father's stories often hit home. He says they are true and happened to him, but there are a couple I've heard elsewhere, perhaps because someone else stole his material, perhaps because for all we'd like to think our story is unique, it really shares a lot with other,or perhaps because Fr. Jim used a little literary license. What story? The one about the woman who was accused of stealing a car because of the way she acted after a near-miss accident (surely someone with all those religious bumper stickers wouldn't act that ways, therefore the cop assumed she stole the car). There was another one that was familiar too. I think "motivational" is a good word to describe this book. You aren't going to learn much theology and there are much better devotionals out there, but this book is the perfect "God loves you and wants you to go out and love others" book, the kind of book that reminds you that yes, you can make a difference in a lot of ways,so get going, do it! In Hope Springs, Texas, every first love deserves a second chance. Luna Meadows wove a successful career out of creating the sumptuous, richly hued scarves that adorn Hollywood’s elite. Now she wants to give back to her hometown of Hope Springs, Texas, by creating a community arts center on the property that once belonged to her best friend: a talented musician named Sierra who perished in a car crash at age eighteen. As Luna sorts through the personal belongings left in the Caffey family’s former home, she confronts her own guilt and memories. 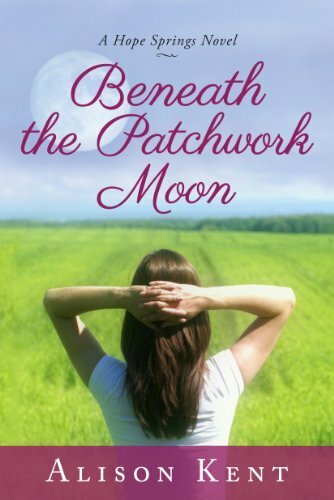 But when Angelo Caffey—Sierra’s brother and Luna’s first love—returns unexpectedly, Luna must also face the pain of their long-ago relationship. Headstrong, handsome Angelo walked away from Hope Springs—and Luna—eight years ago. But this time, he’s staying until he gets his answers. Still haunted by Sierra’s mysterious accident, he demands to know the secrets Luna has harbored all these years. But will revealing the truth leave Luna heartbroken? Or can she finally bury the past and help Angelo come home for good? I enjoyed this romance, which was better written than many are. Besides developing the relationship between Angelo and Luna, we explore the relationship between Luna and her high school best friend. Family relationships are also explored and we see how two people view the life of one family in very different ways. Luna is named for a moth and we see her coming out of her chrysalis and developing into the woman she was meant to be. I definitely recommend this book to fans of romance novels. Thanks to the publisher for providing a review copy via NetGalley. Grade: B+. Question of the Week: Do you have any suggested resources for those trying to kickstart these last weeks of Lent? My Answer: I've really been enjoying Fr. 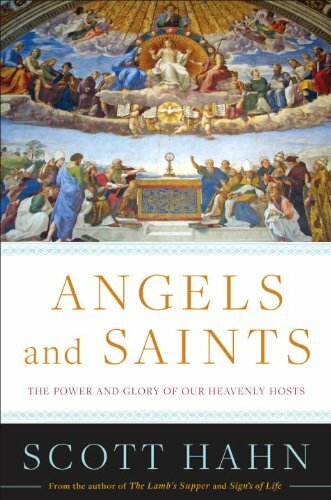 Robert Barron's daily emails. You can subscribe here. This week I published a Monday Memes post where I previewed books I'm reading or have received in the mail. I wrote about something I reflected on while in the adoration chapel this week. FYI, I have floaters in one eye which appeared about two weeks ago and I had a couple of instances of seeing light flashes. They are checking me for retinal detachment but so far, so good, no problem and the floaters are a harmless nuisance that a common in near-sighted people as they age. 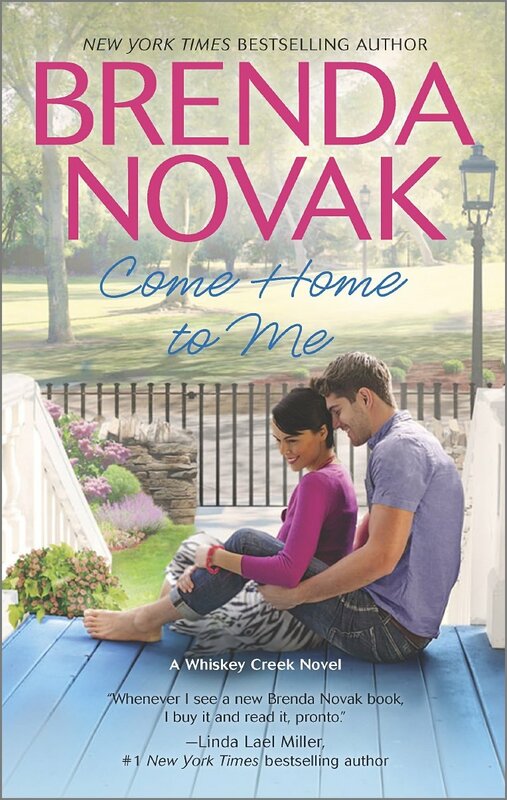 I reviewed Come Home to Me, which is a general market romance and Blossom Street Brides, which while a general market romance, is squeaky clean. Don't forget, I'm giving away a copy of All You Can Dream Buffet. 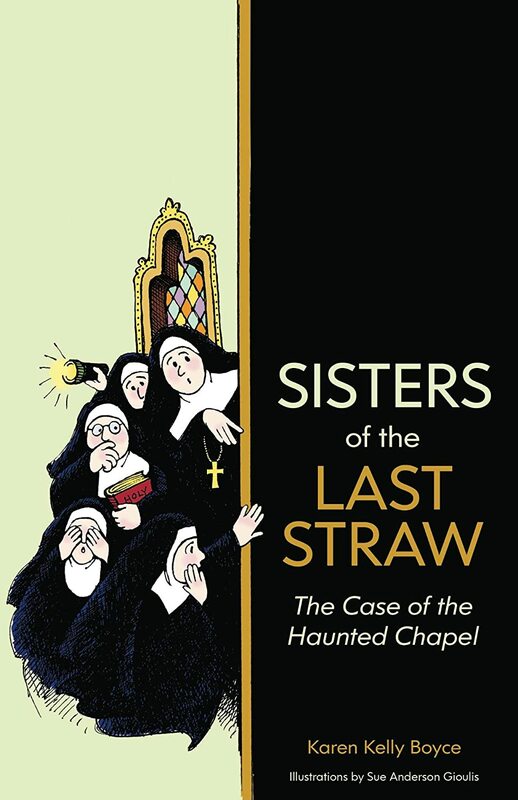 Fans of Macomber's Yarn Shop books will enjoy this newest installment to the long-running series. While this book and others in the series stand along better than the soap operaish Cedar Cover books, it is clearly part of a series. Picking up where A Turn in the Road (my review) leaves off, Blossom Street Brides follows Bethanne through the first months of marriage and dealing with the reality of sharing a family with an ex-husband who'd like to be a part of the family. It also follows the romance between Max's friend Rooster and Bethanne's friend Lauren. While this is not a Christian novel, the characters do not end up in bed until after marriage and we are left outside the bedroom door. The part of the story I found most interesting was the thread about Lydia's adoptive daughter and her grandmother. That is a thread that looks like it will be carried over to the next book as there was no resolution and it is clear that something is going to happen. 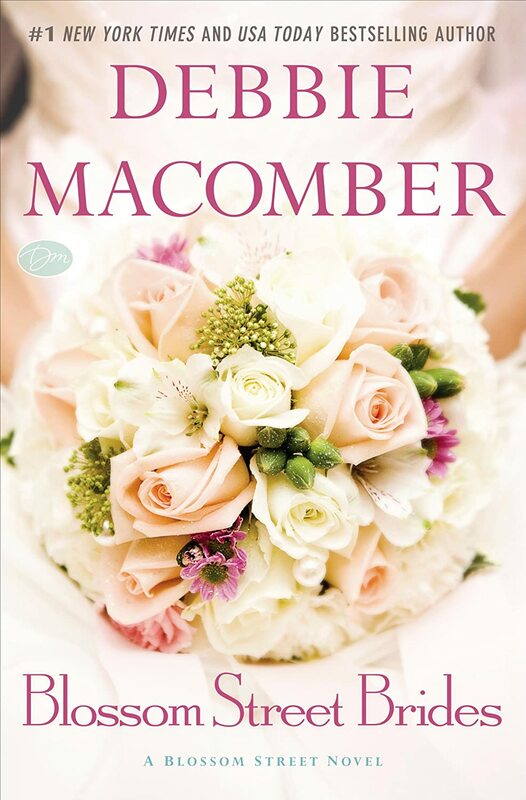 In short, if you enjoy Macomber's sagas, this should be right up your alley, but I'd read A Turn in the Road first. I'd like to thank the publisher for making a review copy available via Edelweiss. Grade: B.
I'm fortunate; with the exception of a bout of tuberculosis as a child, I've been relatively healthy all my life. I haven't been injured; I haven't had surgery except for reproductive reasons. I didn't have too much trouble getting pregnant, staying pregnant or birthing my babies. I've had a couple of annoyances along the way--I've been nearsighted since junior high and my oldest child was born via c-section but on the whole, I've enjoyed good health and until the time I was married and started seeing a gynecologist, I didn't have a doctor. Until my youngest was born and I switched to a pediatrician who was also certified in Internal Medicine, I didn't have a doctor except my gynecologist. Tonight I was in the adoration chapel and the one of the phrases we hear on Good Friday popped into my mind: "But the LORD was pleased to crush him in infirmity". Now, I don't want to give anybody the idea that my current infirmities are in any category close to what Jesus underwent on Good Friday but I saw the eye doctor on Ash Wednesday, on the Friday after Ash Wednesday and again on Monday (the retina specialist a/k/a torture specialist). Today I went to the orthopedist for the foot I sprained before Christmas. The lack of conditioning caused by avoiding walking because of my foot is becoming noticeable in daily life and I'm no gym rat to begin with. Yesterday I was at the physical therapist for my foot, and she asked about the shoulder bursitis she treated me for last year (still hurts at times; the more I do the exercises she gave me, the less it hurts). So is the Lord crushing me in infirmity? Why? A couple of us were joking the other day that getting old is no fun, but it does beat the alternative. Tonight the alternative crossed my mind. During Lent we are supposed to be preparing for the alternative (because it will the alternative taken one day by all of us). When young and healthy and busy it is easy to forget what the future holds and to be concerned about the here and now, or at the least, the future that is more easily imagined. In the end both eye doctors seem to think that the most likely diagnosis is that I'm getting older and that there is nothing I can do about it; however both want to examine (torture) me again shortly. I was told that the foot was likely "just" sprained and that it probably just needed more time to heal, and I was given this lovely stylish boot to wear. Still, if watching my Dad's decline hasn't been enough reminder of my own mortality, these last couple of weeks sure have been. Home is where her heart is. Have you ever read a book where you just wanted to reach inside the pages, grab the characters and sit them down and tell them they are doing it ALL wrong. Well, that's this book for me. Presley had a rough childhood/young adult life but she's got it all together now. She's starting a business, moving out on her own and raising her son. Finally, she's doing things the way they should be done...except that she never told her son's father about the pregnancy or baby. While I disagree with her decision, I can understand it and almost condone it, and if that was the only secret in the book, it wouldn't bother me so much. Presley's sister also has secrets she is keeping from her husband. She doesn't tell him about the father of Presley's baby. Again, given the relationships between the characters in the book, that is almost understandable. However not only is she keeping a big secret about their relationship from her husband, she she takes actions with long-term irrevocable consequences based on that secret, and doesn't tell her husband about it. While Presley's brother-in-law learns Presley's secret after the father does, the other secrets are still secret at the end of the book. I guess they will blow up in a later book in the series. Because of all the secrets I never got terribly attached to any of the characters in this book. I just see what a mess they are all making of their lives. Actually the one I liked best was a spurned suitor of Presley's. He's the kind of guy she needed but of course that's not what she really wanted. The book is clearly part of a series. There is a little reference to the back story but that's not really a problem. Instead we have a bunch of open threads at the end. What will happen when Amos' father gets home? What will happen when Dylan learns the big secret? Will Riley ever find a nice girl? Will he get back with Phoenix, or what will happen when Phoenix gets home? Yes, plenty of fodder for more books. As general market romance, there are a couple of bedroom scenes between unmarried people. While they are by no means graphic, readers are definitely in the bedroom. I'd like to thank the publisher for making a review copy available via NetGalley. Grade: B- (just felt like I spent the whole book watching a train wreck waiting to happen). This post is my contribution to two different link-ups: Mailbox Monday, in which bloggers share (or brag about) the new books that have entered their homes this week, and It's Monday, What Are You Reading, where we talk about what we've read or reviewed. In short, going to the host post and clicking through to various blogs will give you a great variety of books that you just HAVE to read. This week the mailman was very good to me. The nice folks at Catholic World Publishing Group sent me this. As their name implies, they are a publisher of Catholic books including the Lily Trilogy that I reviewed. The Tyndale Blog Network sent me this, and Candace Calvert is a favorite author. This is a book about bloggers and a romance. Enter my giveaway. Our Question of the Week: What are your plans for Lent? I'm giving up sweets, junk food etc. Yes, I have an ulterior motive but things have gotten real out of hand in that department and I need all the Divine help I can get to bring that part of my life into moderation. 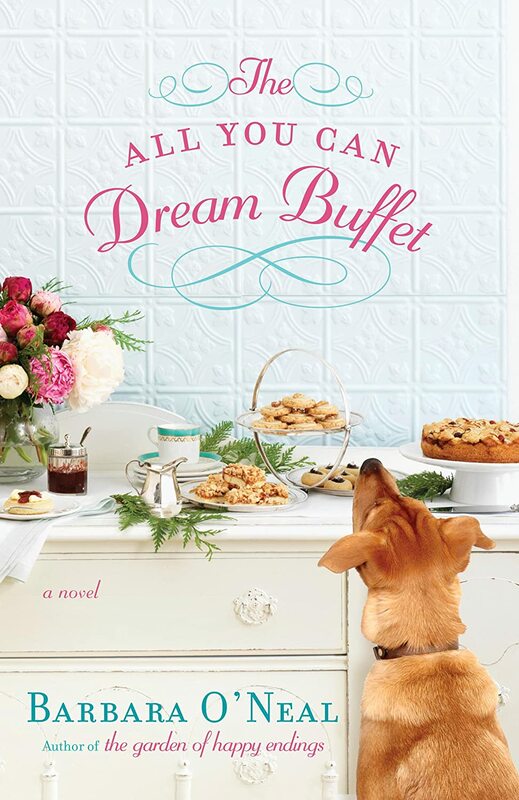 I published four book reviews this week: All You can Dream Buffet is about food bloggers and I'm giving away a copy. Hunger in the Heart is Catholic fiction set in 1950's Florida. Evening Stars is a romance and Runaway Saint is fiction that takes a look at how our image of Jesus effects our lives, or vice-versa. The All You Can Dream Buffet: Review and GIVEAWAY! There’s Ginny, the freckle-faced Kansas cake baker whose online writing is about to lead her out of a broken marriage and into a world of sensual delights. And Ruby, young, pregnant, devoted to the organic movement, who’s looking for roots—and the perfect recipe to heal a shattered heart. Finally, Val, smart and sophisticated, a wine enthusiast who needs a fresh start for her teenage daughter after tragedy has rocked their lives. Coming together will change the Foodie Four in ways they could never have imagined, uniting them in love and a common purpose. As they realize that life doesn't always offer a perfect recipe for happiness, they also discover that the moments worth savoring are flavored with some tears, a few surprises, and generous helping of joy. Back in the heyday of AOL message boards we'd talk about board regulars that we'd met IRL--in real life. In those days before online photosharing when you became a member of an online community you did so under a "screen name" and other people had no idea where you were from, what you looked like or whether you were anything like your online persona. Today in the days of blogs and facebook we see each other's faces, coo over each others kids and share recipes--and just like the good old days, sometimes we meet IRL. This is the story of some bloggers who developed an online relationship who then met IRL. One thing I really liked about the book was the varying ages of the bloggers. Lavender celebrates her 85th birthday in this book. Ginny is in her late 40's; she an empty-nester who feels emotionally abandoned by her husband, her mother and her hometown friends. Ruby is in her late 20's and is pregnant, the result of her last encounter with her now ex-boyfriend. She doesn't know what she wants to do with her life but she feels blessed to have her baby. Val is the mom of a teen; they've recently suffered a major tragedy in life. They all met via their food blogs. They are all together to celebrate Lavender's birthday and because, unknown to them, Lavender wants one of them to take over her farm. Will it be the mom and daughter who are fleeing a great tragedy? The middle-aged woman who feels smothered in her hometown? The young woman who survived cancer as a child? All four of these women are at transition points in their lives and while I didn't agree with the choices all them made, I understood the choices and rejoiced that they had the strength to make them. Few romance novels make the men and women equal characters; most show us one of the members of the couple through the eyes of the other. While romance plays a part in this book, it is far more about the relationships between the women and what needs to happen in the women's lives at that time. Nevertheless there are men. There is Ginny's husband, and the guy she met on the road. There is Ruby's dad. There is the father of Ruby's baby, and finally, the man who has been helping Lavender run the farm. As a blogger I enjoyed the parts where they talked about blogging, about reading comments and about wondering what to write about today. If it is important to you, there is plenty of non-marital intimacy, though none of it is all that graphic. Finally, the book contains several recipes that look yummy! The publisher has graciously offered my readers the opportunity to win a copy of The All You Can Dream Buffet: A Novel . 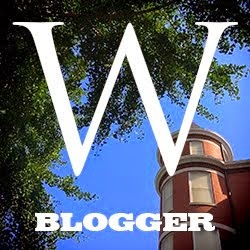 To enter, leave a comment with your email address and a link to your favorite food blog. For additional chances to win, share about this giveaway on facebook, twitter, Google+, on your blog etc or even via email. Each share is worth one entry. Leave a comment letting me know you shared. Winner will be selected March 15. US mailing addresses only.